In the previous RPC blog on teen anger management, NRS discussed identifying and recognizing how bodies and minds react to anger and how to better manage those emotions. Module 10 follows this discussion by focusing on stress management for teens, and more importantly how to address and reduce stress in life. 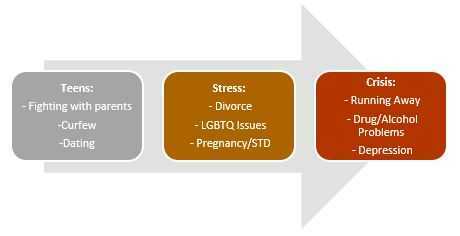 Module 10: Stress Reduction asks youth to consider the stressors that they face during adolescence. When you consider the number of possible stressors, added to the normal challenges of being a preteen or teenager, it’s easy to understand how quickly a crisis can form. This can vary from person to person, as we all have different levels of tolerance to stress and ways we cope. Everyone experiences stress on a daily basis. Some are easy to deal with, while others may result in a crisis taking place. In other words, a crisis is any situation that an individual finds intolerable or unmanageable. It’s first important to think about the person, place, thing, or event that may be causing stress. By identifying some of the stressors that may be in their lives, youth can then start to break down ways they may be able to reduce or safely work through these stressors. In the activity, “TEENS + STRESS + RESOURCES = CRISIS AVERTED,” youth can better understand the relationship between stress, pressure, and resources (or lack of resources). This can illustrate their impact on a teen’s decisions and behavior. When looking at situations that most teens face and then adding on additional stressful life events, if youth have no resources, crisis situations can arise. Young people who run away or enter into a crisis situation usually don’t do so “out of the blue.” Rather, there are often a series of stressful life events that led up to their decision. A major point of this activity is to identify resources that may help when stressful events arise. This can help youth to avoid entering into that crisis situation. These may include supportive family, school personnel, social service agencies, and hotlines like 1-800-RUNAWAY or other community supports. Finally, youth get a chance to explore and practice problem-solving and skills for stress management for teens. With an activity like the “Decision Tree,” they can explore possible solutions to a specific problem. They can then map out what the pros and cons of each solution would be. Stress can come from many avenues of a teen’s life. When youth become overwhelmed and don’t know where to turn for help, they may engage in negative or destructive behaviors. 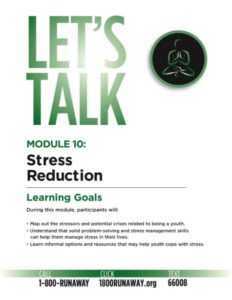 Module 10 gives youth the appropriate tools and resources to work through stressful situations. In the future, they will be able to cope in a healthier manner.